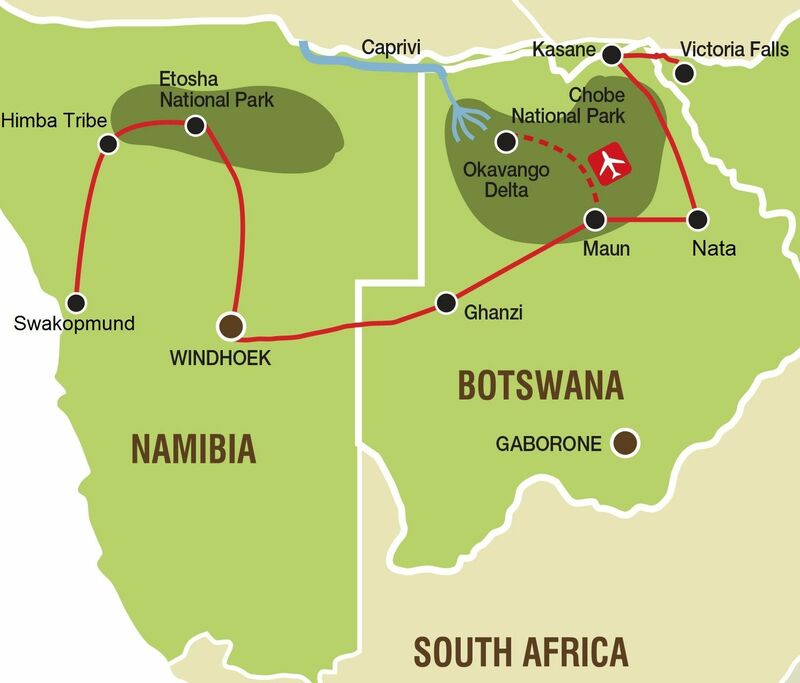 The Namibia and Botswana Safaris are 12 day sections of the 20 day Cape Town to Victoria Falls tour. If you prefer a bit more comfort while traveling around Africa, this is the tour for you! Highlights include: Swakopmund, Spitzkoppe, Brandberg, safaris in Etosha National Park, the Bushmen tribe, the Okavango Delta, Chobe National Park and of course Victoria Falls. Our Namibia and Botswana lodge tour start in Swakopmund, Namibia. Leaving early, we make our way to the massive granite formations of Spitzkoppe which tower 700 metres above the desert plains below. The presence of rock art indicates their significance to the San people who lived here many years ago. We will enjoy a walk with a local guide and have the opportunity to view some examples of the San’s rock art before setting off for our overnight stop for the evening. The Brandberg (meaning Burning Mountain) are regarded as the highest mountains in Namibia and home to the famous White Lady, one of more than 45000 rock paintings in the area. This morning we will make the 1-hour hike to visit the painting that is said to be around 2000 years old. (Please be advised that the hike does traverse rough terrain along the gorge of the normally dry Tsisab River). After exploring the area, we continue our tour to the area of Kamanjab. We rise early this morning and drive to the Etosha National Park. Etosha National Park is the venue for some of the most unique safari experiences in Africa. This afternoon we reach the park and begin with our first game drive (looking for wild animals) as we make our way to the rest camp. Today we depart for Windhoek. Upon arrival in Windhoek, we will take a short walk through the city centre and have the opportunity to view some its better known landmarks. We overnight halfway between the city and the airport. Today we continue to travel east and make our way to neighbouring Botswana and the Kalahari Desert. Very different to the Namib Desert after which Namibia is named, the Kalahari desert is no less dramatic and covers over 900 000 square kilometres. The San people have long been associated with this harsh environment and tonight we enjoy a dance evening that provides an insight into their culture of song, dance and story-telling. Before we leave Ghanzi, we will enjoy an informative guided walk with the San community. After our walk, we head towards Maun, where upon arrival in Maun this afternoon, you will have the opportunity to go on an optional scenic flight over the Delta (time and weather permitting). This evening our guide will prepare us on what to expect on our full day excursion into the Okavango Delta. We leave the Okavango Delta and Maun behind us this morning (and re-uniting with those that chose the upgrade package) we make our way towards the town of Nata. We will spend most of the day in our truck as we journey across the northern reaches of the Makgadikgadi Pans. Our activity package will afford us the opportunity to enjoy an afternoon guided game drive (safari) to the Nata Sanctuary, which forms the breeding ground for a host of water birds including pelicans and flamingo in their thousands. It's another early morning as we continue north to our lodge on the banks of the Chobe River. This afternoon is set aside for exploring the Chobe National Park. We begin our exploration in 4x4 vehicles, which allows us an up close and personal experience with the many elephants that frequent the river in the afternoons. The afternoon ends with a leisurely boat cruise and a meal served around the campfire.